Australia’s Great Barrier Reef needs no introduction as a natural wonder and highly sought after travel destination. The people behind Grand Reef Casino hope that Aussie gamblers will find that picturesque underwater themed online casino destination equally amazing. The instant you log onto this colourful site bedecked in inviting ocean blue and vivid pink and witness the improbable sight of bonus chips and a pair of dice right beside creatures of the sea, you are hooked. The flashing message to “Play now” is almost redundant because it is obvious that you are not going anywhere. The urge to dive in and try to scoop up whatever treasures you can may be irresistible. We review many online casinos and give our readers an honest and unbiased appraisal of each one. We know, too, that Australians can choose from hundreds of sites, so it will probably take a place that is in some way special and out of the ordinary to get your attention. So we commend Grand Reef Online Casino for coming up with such a creatively designed and aesthetically appealing website. But more importantly, GrandReefCasino.com is not all show and no substance. You can choose from almost 200 popular casino games, including about 100 pokies. In addition, all players are offered a very generous five-part Welcome Bonus up to AUD$5,000 upon signing up. The generosity continues in the form of a six-tiered loyalty rewards program. Grand Reef Casino was established in 2010. It is licensed in Curacao and powered by Playtech, a company known internationally for providing top quality software for many online casinos. You will welcome not only the wide variety of games, but the superior graphics, sounds, and animations, which greatly add to the enjoyment of playing. Grand Reef Casino also takes its responsibility to provide fair games in a safe and secure environment very seriously. Through the use of advanced digital encryption technology, every player’s information and on site activities are fully protected. In addition, all of the games have been checked for fairness by Technical Systems Testing (TST). While, obviously, there is no guarantee you will be a winner at Grand Reef, you do have the assurance that your account will be kept secure and that you will be treated fairly. At the present time, Grand Reef Casino is off limits to residents of the U.S. and UK. However, players from Australia are always welcome. In fact, Grand Reef Casino caters to Aussie players. Welcome Bonus near useless except for pokies and progressive jackpot pokies don’t count at all. Grand Reef, with some 200 games, may not be grand in size, compared to some online casinos, but it has certainly come up with a grand gesture in its Welcome Bonus offer. While practically every online casino offers some type of Welcome Bonus, few offer a cap as high as Grand Reef. However, before you rush to accept the Grand Reef Casino Welcome Bonus, expecting immediately to be thousands of dollars richer, you need to understand the terms and conditions. For starters, you do not get the entire bonus all at once. It gets delivered to you in five stages, corresponding to your first five deposits with the casino. Here are the other important facts you need to know. Valid on pokies (except progressives), table poker, roulette, blackjack, craps, baccarat, and Sic Bo. However, only pokies count 100%. Table poker and roulette only count 25% and the other allowed games only count 5%. As part of this Grand Reef Casino review, it is important to comment on not only what is great about this bonus (how big it is), but also some aspects that are not so great, which you need to keep in mind so you can benefit from it rather than be hurt by it. For starters, the 40x playthrough on both the bonus and deposit combined is quite high. As great as it would be to get the maximum bonus of $5,000, you will need to deposit a total of $2,500 (five separate deposits of $500 each) all in one week, and then you will have to give the casino $300,000 worth of action. If this is more than you can comfortably afford, you should deposit less and be content with a smaller bonus. Furthermore, only pokies count 100% towards meeting the wagering requirements. The other permitted games count only a small fraction of the full amount, so for all intents and purposes, this is a bonus for pokies exclusively. It is too bad that not only are progressive jackpot games not allowed at all, but the casino is limiting your winnings to only 3x the bonus + deposit. Thus, for example, if your first deposit is $100 and you then receive a $150 bonus, the maximum you would be able to cash out on that part of the Welcome Bonus after putting $10,000 into play ($250 x 40) is $750. What is nice about this Welcome Bonus is that it gives you plenty of ammunition to play with, thus improving your chances to win in case you don’t get lucky right away. When all is said and done, upon meeting the specified playthrough requirements, the bonus, your deposit, and the allowable portion of your winnings are all yours. 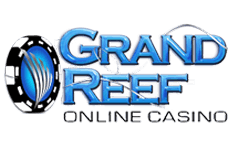 All players receive the Grand Reef Casino monthly newsletter, the ability to convert comp points to cash, free wire transfers, and 24/7 customer support. However, as you move up the VIP ladder, you qualify for bigger bonuses and promotional offers and increased deposit and betting limits. The casino could be more specific about what kinds of extra benefits are forthcoming at each higher level. However, unlike at some online casinos, once you achieve a certain level, you are not required to keep up a minimum number of points each month to maintain it. Once you achieve a certain VIP status, it is yours for life. From time to time, Grand Reef Casino also offers various special promotions. Some of the past promotions have included drawings for all expenses paid trips to fabulous destinations like the Grand Barrier Reef and Melbourne Cup or deluxe prizes like spa treatments or an iPod Touch. Keep checking the website for more special promotions. Right now and presumably ongoing indefinitely, all players can take advantage of the following promotion to “invite a mate” and receive an extra bonus. If you enjoy playing at Grand Reef Casino, there is a good chance your friends will, too. For each friend you invite who signs up to play and opens an account with a real money deposit of $25 or more, you will receive a $50 bonus. See the website for additional terms and conditions. Play at Grand Reef Casino with your AU$5,000 Bonus Now! All you have to do is register with a real money account and download the software, and this casino promises you an “underwater adventure of a lifetime.” That it certainly will be if you hit one of the huge progressive jackpots, some of which are over a $1 million and climbing. But in any case, Grand Reef Casino looks like a fun place to hang out. It is not so huge that you are apt to find yourself lost in a sea of games, but large enough for you to find just the game you are looking for whatever your playing tastes and bankroll happen to be. With the help of the easy-to-navigate website, Grand Reef Casino should have you happily entertained with a nice choice of almost 200 casinos games, about equally divided between pokies and other popular games. The Playtech name assures you that all of the games are state-of-the-art, making use of advanced computer technology to bring you an online playing experience that is every bit as exciting as playing in a real casino. All of the games have been independently checked for fairness by Technical Systems Testing, so you can relax on that account. However, we are disappointed that there is no mention on the website of the average rates of return to the player. With long playing sessions, even small differences can add up, and with table games, rules matter and can affect your likelihood of winning. One feature we like very much, and we think you will, too, is that the games are not only conveniently organised by category, but as soon as you click on a particular game, you will find a brief description that will help you decide if you want to play it. Another great feature, if you are still unsure if you want to play, or if you would like to practice a little before betting real money, is that you can use play money initially and then, if you like the game, switch to real money later. Most Aussie casino players love playing the pokies, and hopefully, you do, too, because those are the games you need to be playing to clear the Welcome Bonus. The pokie machines at this casino are conveniently divided into progressive jackpot games, classic pokies, and video pokies. For each of the progressive jackpot games, you will be able to see instantly what the top jackpot payout is at that moment and then, if you wish, you can play one of the games with the highest jackpots. Play on the progressives won’t count towards clearing the Welcome Bonus, unfortunately, but otherwise, if you’re feeling lucky, you should take a shot. You have as much chance as anyone else. The 5-reel video slots are also exciting to play. Included in the bunch are a number of games you are probably already familiar with like Fantastic Four, Incredible Hulk, and Iron Man. Or, if you prefer to try something new and different, Grand Reef Casino offers plenty of those, too. In addition to all of the above, live dealer games are offered. These exciting applications of modern computer technology are as close as you can get to playing in a real casino without actually traveling to one. We were hoping to call this section of our review “Grand Reef Casino Mobile Review,” but we cannot do that because as of this writing, no Grand Reef Mobile Casino exists. This is unfortunate because these days many people own an IOS iPhone or iPad or other smartphone or tablet (Android, Blackberry, Windows, etc.) on which they would like to be able to play their favourite casino games while on the go. There is no Grand Reef flash casino either. With Grand Reef Casino download the only option, the only way the games can be played is on your own computer. Hopefully, the casino will introduce a mobile app soon. Grand Reef Casino accepts a variety of safe and secure payment methods. All of the following are not only available to Australian players, but allow use of AUD. Besides AUD, other currencies that this casino accepts include USD, CAD, EUR, NZD, and INR (Indian Rupee). Withdrawal processing time is stated on the website as within 7 business days, depending on the method. However, some customers have complained that about slow withdrawals. High rollers will be happy to hear that wire transfers are complimentary and there is no upper limit on withdrawals. Players at higher VIP levels receive higher deposit limits also. Whatever banking method you use, the casino’s use of advanced encryption and Firewall technology ensures that all financial transactions are completely safe. Customer Support is available 24/7 via live chat, phone, or email to address any questions or concerns you might have. This casino appears to only offer support in English.